U.S. Sen. Ted Cruz, R-Texas, speaks to reporters after Senate Republicans unveiled their version of legislation that would replace the Affordable Care Act, also known as Obamacare, on Capitol Hill in Washington, June 22, 2017. Senate Republicans clashed Sunday about the path forward for their stalled health care bill, with passage of any plan before the August congressional recess in doubt and rival factions trying to pull it in opposite directions. While some conservatives and President Donald Trump have suggested repealing President Barack Obama’s Affordable Care Act and replacing it later in a separate measure if the party can’t pass a combined bill, Cassidy called the idea “a nonstarter” that would raise premiums and betray Trump’s campaign promises. 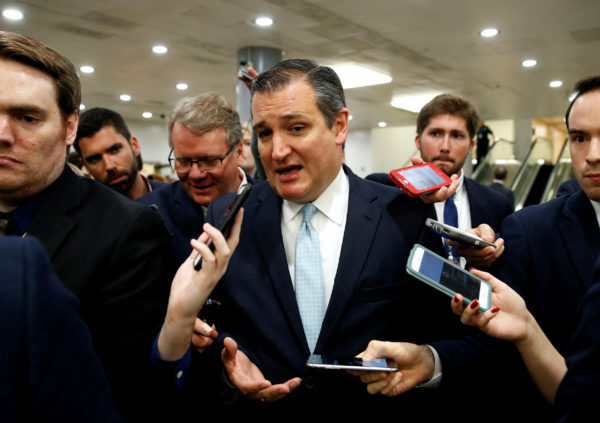 U.S. Sen. Ted Cruz of Texas, a leader of the conservative faction in the chamber, separately pitched his proposal to allow insurers to offer insurance plans that are cheaper with less coverage, as long as they also offer a plans complying with the Affordable Care Act’s mandates. Critics have said that approach will result in higher premiums for older and sicker Americans, including those with chronic, pre-existing conditions, as younger, healthier people choose more basic plans. But Cruz said it would give millions of people more affordable choices, and that taxpayers would subsidize sicker people with money already in the bill for plans in health-insurance exchanges. Cassidy said he’d have to see the legislative language for Cruz’s proposal but that it would be bad for older, sicker people to be separated into their own pool for insurance coverage. Republican U.S. Sen. Chuck Grassley of Iowa previously told Iowa Public Radio that he’d oppose the measure if it undermined protections for pre-existing conditions. Cassidy’s bill with Collins would keep most of the Affordable Care Act’s taxes to pay for a more robust replacement. He said that’s “the only path forward” that would allow Republicans to keep Trump’s campaign promises such as protecting people with pre-existing conditions while eliminating Obamacare’s insurance mandates. But Cruz said consumers also should have the ability to buy cheaper plans with less coverage, and that many people simply can’t afford plans under Obamacare. “You, the consumer, should be able to choose what health care you want to buy,” Cruz said on ABC’s “This Week.” He added that it’s “wildly unfair” for younger people to subsidize older, sicker people and said taxes, not mandates, should pay for that. Priebus said the Senate “will get a repeal and replace” bill passed either before or “during” the August recess, and that senators are putting together their wish lists for the measure. “I don’t believe it’s in half as much trouble as the media wants it to be in,” Priebus said of the health care measure crafted by Senate Majority Leader Mitch McConnell and a small number of Republican lawmakers. Barrasso said expansion of Medicaid under Obamacare made the joint federal-state health-insurance program that covers millions of poor and elderly people a “dumping ground” for able-bodied adults. That’s a different view, however, from Republican senators such as Dean Heller of Nevada, Lisa Murkowski of Alaska, Shelley Moore Capito of West Virginia and Rob Portman of Ohio. They’ve insisted on protecting people who gained insurance through that expansion in their states. McConnell last week left open the possibility that Republicans won’t be able to reach a deal, saying a bipartisan fix to stabilize the insurance market would still be needed if that happens. U.S. Sen. John McCain of Arizona said on CBS’ “Face the Nation” that he thinks the leadership’s bill is “probably going to be dead.” He blamed a partisan approach similar to how the Affordable Care Act was originally passed in 2010 by Democrats without any Republican votes. Bloomberg writers Mark Niquette and Ben Brody contributed to this report.